Discussion in 'Server Announcements' started by ypperin, Oct 26, 2018. Trick or treat, smell my feet, give me something good to eat! That's right, with Halloween this week we are starting the festivities today, or rather, last night, and have we got a list of updates for you! Looking for something over the top to celebrate the holiday with? We've got you covered! Got what it takes to Master the warzone? 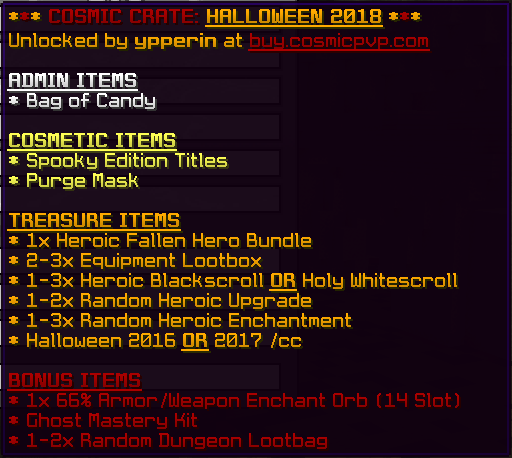 Mastery Kits are a whole new take on what a kit is on Cosmic featuring highly coveted enchantments that only work on /mkits these bad boys are sure to take your pvp game to a whole new level: Introducing the Ghost Mastery Kit! Highly coveted and only available on /mkits Mastery Enchants are going to change things up on the battlefield! 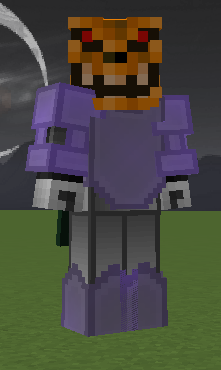 These enchants can only be obtained on /mkit armor and are not able to be black scrolled! Once your enemy is afflicted with Mark of the Beast their incoming damage will be multiplied for up to 5 seconds! Immune to the snare of Nature's Wrath meaning Nature's Wrath will be unable to freeze you in place, this enchant also has a chance to negate Revenge of Yijki and Dimensional Traveler's special abilities! Mastery Shards are obtained by tinkering /mkit gear and are used to upgrade Enchantment Books so that it can be applied to an /mkit piece. Enchantment books can not be applied to /mkit gear without having a Mastery Shard applied to it. 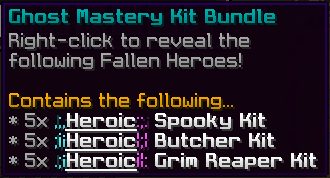 Mastery Kits are changing things up so we have created, on the Server Store, a Ghost Mastery Fallen Hero Bundle featuring 5 of each of the required /gkit Fallen Heroes for the Ghost Mastery Kit! Available through the Halloween /cc and at the Server Store this is Cosmic's first mask that has a bit of an edge boasting an outgoing damage buff of 2.5%! Get a hold of this bad boy while you can! Snuggle up to something terrifying! This mask is limited edition and a rare drop from Trick or Treaters! It's back, with a gruesome twist! Appearing at /battlefield, players will be able to take on the Evil Abomination and his gang of Headless Kings! 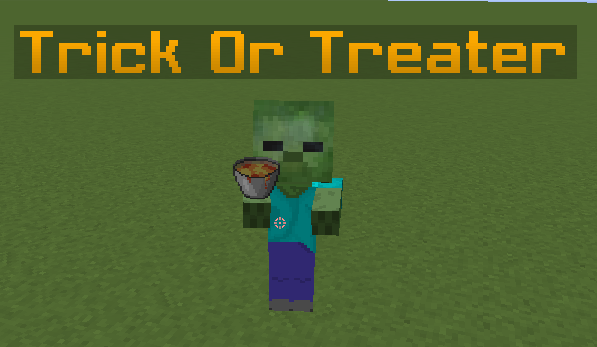 Defeat them to spawn a Pumpkin Harvest Event with loot filled jack-o-lanterns spawning nearby! 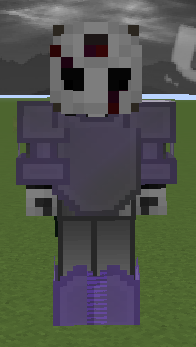 These little zombies have a chance of spawning anywhere throughout your planet! Kill them and steal their candy and maybe get your hands on a Pumpkin Monster Mask! Something sweet in the spirit of the holidays with a chance for a spooky surprise for those able to complete them! That's right, this week KOTH has a chance of being decked out for the holidays with the capper having a chance at ANY of the KOTH Set pieces PLUS we've spookified Battlefield, Spawn, and Hubs! We've tweaked Jackpots to run more frequently! Players can look forward to a /jackpot being drawn every hour now!